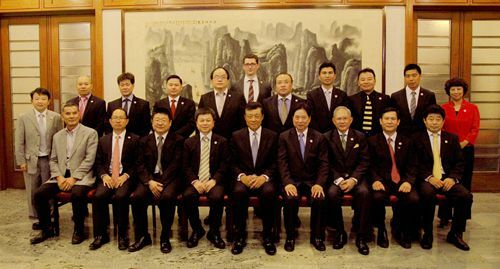 On 14 August, 2013, Ambassador Liu Xiaoming met with the President of the UK Chinese Business Association (UKCBA), Jimmy Zhang, and other Executive Council members. Ambassador Liu welcomed the guests to the Chinese Embassy and applauded the positive role of UKCBA since its establishment last year in promoting unity among Chinese community, improving the status of Chinese business people and participating in China-UK economic cooperation and trade. Ambassador Liu briefed the guests on the current situation and prospects of the China-UK political, economic and trade ties and expressed the wish that the UKCBA would seize opportunities to play a bigger role in growing bilateral economic and trade ties and actively bringing Chinese enterprises to the UK. He said that the Embassy is the home of overseas Chinese business community and Chinese nationals in the UK and it will give continued support to the work of the UKCBA and other Chinese organizations in the UK. President Zhang expressed his appreciation to Ambassador Liu for his attention to and support of the UKCBA and briefed the Ambassador on various activities the association conducted over the past year. He said that the UKCBA will consider it its own responsibility to promote the growth of China-UK economic and trade relations, strengthen the links and cooperation between Chinese and British business associations, and contribute its own share to China-UK friendship.